This is a book that I’ve been dying to read for ages – I wasn’t even around in the 80s (being a 90s baby an’ all) but the nostalgia is something too sweet to miss. I still grew up on 80s films and pop culture so I could relate to most of this, even if I didn’t live it. The book itself is a beauty to behold, the inside cover pages have handwritten yearbook notes from the main character’s high school friends which is always fun! 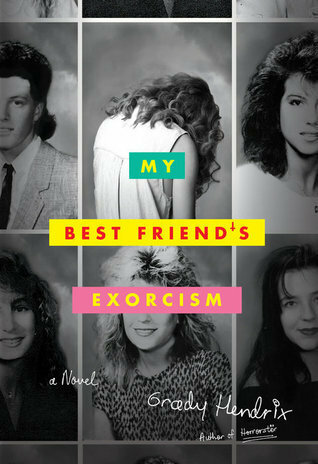 It’s hard to explain exactly why this book is so good – the story itself isn’t particularly original and is pretty reminiscent of an 80s horror film where friendship triumphs over all but it just strikes every chord needed to be an amazing story. The high school experience described in this book is so spot on that I’m pretty sure that anyone who went to high school, in any decade, will be able to relate – it draws you in with the sense of familiarity and reminds you of a time when your friendships were the most important thing in your life. I imagine most people remember the obsessive friendships they had way back when (or, god forbid, you may actually still be in high school now… in which case, stop reading! ), thinking they would last forever. That’s the kind of friendship at the heart of this book – what kind of horrors would you go through alone to save that friend? Hendrix’ gift is creating a story that completely draws you in and plays out like a camp horror film in your head – even the gore and nasty bits in this book aren’t particularly scary, they just get the point across. I would recommend this book to any fans of Stranger Things style nostalgia or anyone falling into the trap of remembering high school fondly….